Petroleum, (from Greek πέτρα - rock and έλαιο - oil) also called crude oil, is a thick and black liquid. It is a natural material mainly made of hydrocarbons. Most petroleum is found by drilling down through rocks on land or off-shore on the continental shelf. Major producers are in the Middle East, the Americas, and Russia. It is the most important world fuel source. It supplies 38% of the world's energy and is also used to make petrochemicals. Crude oil is a mixture of many different chemicals (mostly hydrocarbons), most of which burn well. It is separated into simpler, more useful mixtures by fractional distillation in oil refineries to give separate chemicals such as gasoline (or petrol) for cars, kerosene for airplanes and bitumen for roads. 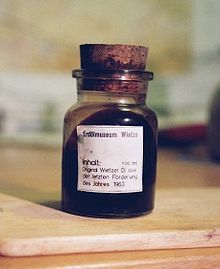 The bitumen gives crude oil its dark black color; most of the other chemicals in crude are slightly yellow or colorless. Petroleum can be easily transported by pipeline. Treated petroleum can be used as fuels; mainly gasoline (petrol) for cars, diesel fuel for diesel engines used in trucks, trains and ships, kerosene fuel for jets and as lubricants. Petroleum resource is limited and non-renewable. Some believe it will run out within 70 years after a peak oil early in the 21st century. Burning petroleum or other fossil fuel adds the carbon in the oil to the oxygen in the air to create carbon dioxide, which is an air pollutant. The carbon can be removed from the carbon dioxide by plants. There is a lot of crude oil left underground. Oil companies quote "reserves" which some people confuse with the actual amount of oil underground, but are more to do with the cost of extracting it by oil wells. Most of the crude left underground is in the Middle East which is not a politically stable part of the world. Some governments with lots of oil reserves work together through OPEC to keep production low and prices high. Politicians in countries that burn much oil complain about high oil prices, because voters complain. However many environmentalists worry about damage being done by using oil as a fuel source (especially global warming) and are therefore happy when prices are kept high so that people use less oil. Wikimedia Commons has media related to Petroleum.